This recipe has jumped the queue. I have quite a few recipes stored up for posting, but since I’ve already raved about this recipe to two people I figured I needed to get it posted ASAP. I saw this recipe and thought it would be good for another one of my dad’s retreats. I wanted to make pumpkin snickerdoodle cookies, but I was afraid they’d get a bit stale by the time they were eaten at the retreat. So when I saw this cookie cake recipe I knew it’d be the perfect way to have cookies without the fear of them getting stale! And then I made it and the batter was delicious. And the whole house smelled delicious. And it looked so perfect…so I stole a corner. For Research! I couldn’t post a recipe I didn’t at least get to try! So for you, dear readers, I sacrificed a corner for a sample. Holy yum. I need to make this again ASAP and then find a way to not eat the whole pan by myself. Preheat oven to 375°F. Line a 9″x13″ pan with parchment paper. In a large bowl, cream butter and sugars. Add eggs one at a time and mix well after each addition. Beat in the vanilla. Sift together flour, soda and salt. Stir into the butter mixture. Fold in the chocolate chips. Spread batter out in the prepared baking sheet, pushing batter into the corners. 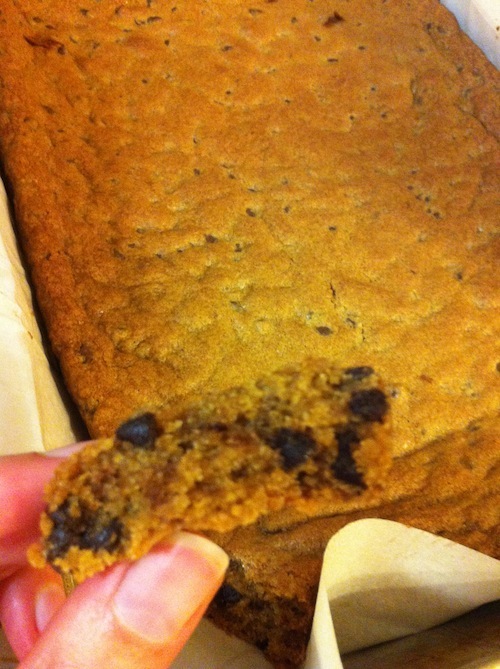 Bake for 23-28 minutes, until edges are golden and the cookie is set in the center. It might jiggle a little in the pan but not a lot. Let cool for 10 minutes, then transfer to a wire rack to cool completely. So good! Thanks for visiting, Nicole!! We need a reason to make this…or just a time. We can have as much as we want and then feed the rest to Devin.